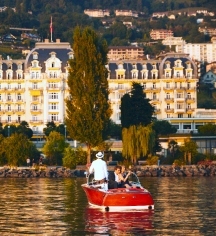 As a world class, five-star hotel, Fairmont Le Montreux Palace offers guests all the facilities and amenities needed on premises. With three restaurants, two bars, one lounge, 236 guestrooms, over 40,000 square feet of meeting space, a spa and fitness center, the palace is well equipped to handle all guest needs. Gracious staff have been expertly trained to provide the highest quality hospitality in this stunningly gorgeous Palace in the Alps.